Twenty years ago a legend was born! Baldur's Gate is a legend we're still in awe of. Our hats are off to BioWare for creating this masterpiece. We’re proud to celebrate this anniversary with all the Baldur’s Gate fans around the world! In just seven days, we’ve heard nearly 500 amazing stories from fans sharing their favorite Baldur’s Gate memories. It shows how much a game released twenty years ago still means for many people. Choosing our favorites from the shared memories was difficult. Many of the stories shared on Twitter, Facebook, and the forums were sincere, touching, and downright relatable. Many made us smile, while others are so emotional they nearly made us cry. The winners of 8 Swag Packages are Chaotica and Renaske from the Beamdog forum, aARon cliffVRd‏ @EgoAnt and This guy‏ @neokarny from Twitter, Marko Infovich and Wojciech Pelczar from Facebook, plus two people who signed up for the Beamdog newsletter! Congratulations! Each of you will receive cool game & t-shirt packs! 20 years ago, Chaotica was a sad kid but Baldur’s Gate helped bring their family together: “I was in remission from an autoimmune disease; my parents had split up seemingly out of the blue; my brother left for uni and my best friend moved schools. I was a very disenchanted nine year old girl. It turns out, I just needed a little fantasy. Getting to know my step-dad was a difficult process - we're not really 'people' people. I would go to this new house where my mum lived and this other bloke would be sat in the corner on his computer. My brother played computer games, but I was the annoying kid sister so I never really got to play. But my mum's boyfriend didn't mind me watching over his shoulder, and so sitting at my mum's PC to his left (he was the first IT expert I'd met) I would spend hours watching him slay mythical creatures and going on quests. Then, Baldur's Gate came out. Oh boy, did my life change. 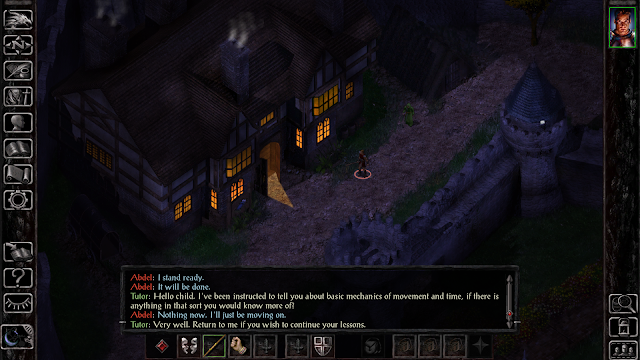 When Baldur's Gate came out, I was asked if I wanted to play and of course I jumped at the chance. I created Chaotica, the half-elf ranger cleric, as player two to my step-dad's human fighter on our LAN game. With that, I became a gamer. 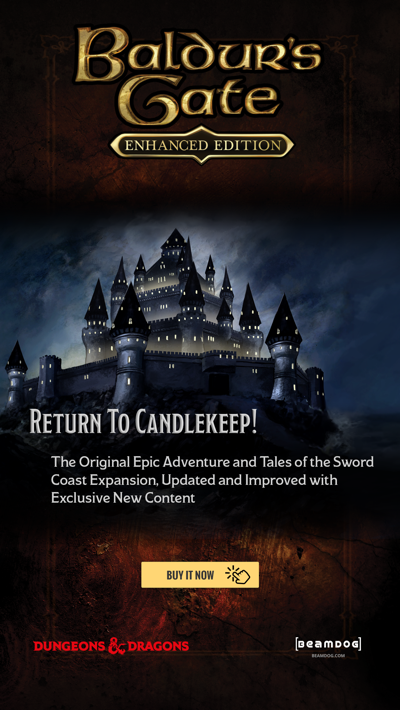 Every weekend we would reveal more of the map as we explored the world outside Candlekeep, meeting characters that kept me company for so long. My memory is hazy (mostly because I threw myself into BG:ToB as soon as it came out and never looked back! ), but my world brightened with the hours poured into these games. I consumed everything Fantasy and Fantasy-adjacent. I played all the games I could get my hands on. When aARon cliffVRd‏ @EgoAnt and his wife got together 20 years ago, he was broke and unemployed: “She asked me if she could give me a bit of money for rent - I said, "No, but I really want Baldur's Gate, if you're feeling generous". We are still together. I still have that copy of BG”. Bubb, Zaghoul, and Mantis37 from the Beamdog forums, Galiskner‏ @Galiskner, AnaisAndStuff @AnaisAndStuff, and Lihvarček Miša @lihvarcekmisa from Twitter, Sophia Lamar, Edson Pagola, Yohan Lippert, Kathy Paxton-Williams, Igor Beczek, Colin Listner, and Gary Grant from Facebook, plus two people drawn from our newsletter list will receive their choice of a digital PC version of one of our games, or their choice of one of our games with all currently available DLC on mobile. Congratulations! 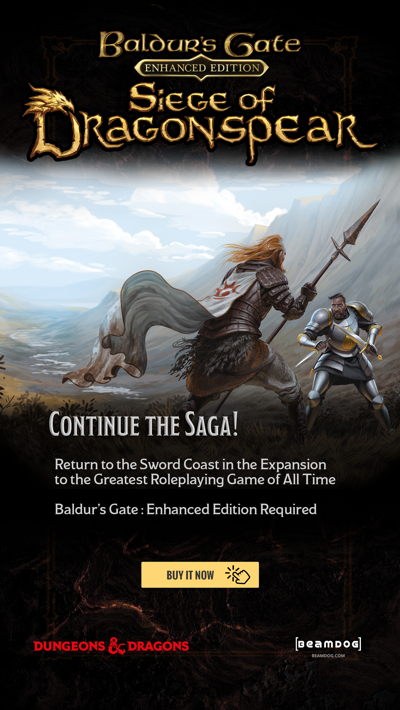 Another game package winner is John Winski, a famous writer, programmer, and designer on many games, including Baldur’s Gate (remember Winski Perorate, the Sarevok's mentor)! His favorite memory “will always be when someone decided to level up Gorion so that the opening battle with Sarevok would look more impressive.” He was really confused when Sarevok died and so was Gorion. And last but not least, thirty-two winners from Twitter, Facebook, forum, and newsletter entrant pools will receive their choice of a digital PC DLC for our games: we drew 10 winners from the newsletter entrant pool, Kenji, Altair, Enuhal, ZaramMaldovar, Grond0, modestvolta, OurQuestIsVain, Aedan, WithinAmnesia, and MERLANCE from the Beamdog forums, Hansel Eldor @HanselEldor, Eevee @Lohapedrar, wedge @wedge_one, goblin @zipperblues, Michael J C @MercKilsek, shaydh @the_shaydh, and Lord Fenton Gaming @FentonLord from Twitter, Jampd Balodis, Björn Eknem, Liz Walker, Andy Landon, and Greg Scott from Facebook! Thank you to everyone who shared a story! We’ll contact all the winners after the holiday period. Where's dat 2.6 at tho?